Thanks for subscribing to Axios Science. Please consider inviting your friends and colleagues to sign up. If you have any tips or feedback, you can reply to this email or send me a message at andrew.freedman@axios.com. Podcast news: Axios' Dan Primack launched “Pro Rata,” the podcast, on Monday. Subscribe here to get smarter, faster in just ten minutes on the collision of tech, business and politics. Research continues to show varied results on the question of whether e-cigarettes can help tobacco smokers quit, although recent evidence appears to be leaning toward the "no" side, Axios' Eileen Drage O'Reilly writes. Why it matters: If vaping can help smokers quit, it could save some of the 480,000 Americans who die yearly from tobacco-related conditions. But, even if they can help smokers quit, there's also indications e-cigs are ushering in a new generation of adolescents hooked on nicotine who may be more likely to start smoking tobacco later. On the one hand: The American Cancer Society issued a commentary paper in early June that says the need to halt the use of combustible tobacco products (i.e. cigarettes and pipes) is an absolute priority and e-cigarettes should be considered a possible tool to achieve this. Some studies saying e-cigs can help people quit smoking tobacco include those in the British Medical Journal and Substance Use and Misuse. "We need to be open to considering these as one tool to help smokers quit. ... 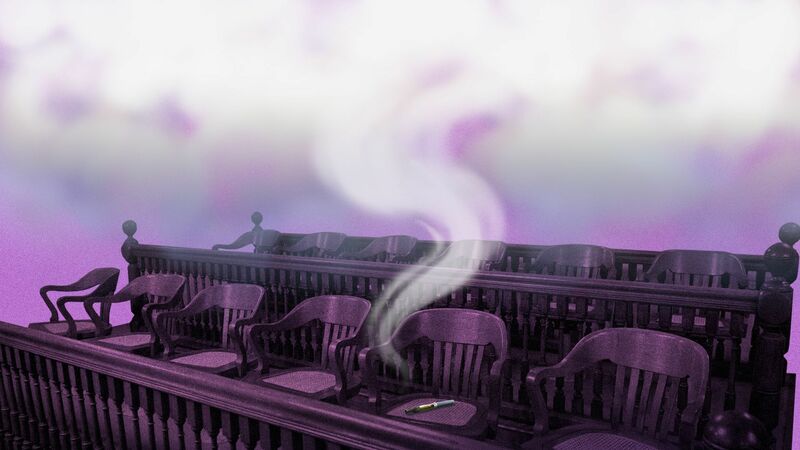 Even though the jury is still out ... the state of science is that they are less significantly harmful than smoking combustible products. It's a matter of degree." On the other hand: Some recent research indicates that e-cigarettes may not only fail to help smokers quit, but they could make it worse. Smokers will add on e-cigarettes when they are in places that don't allow tobacco smoking and they'll just smoke both products. Studies supporting this view include those in PLOS ONE and JAMA Network Open. "Overall, when the dust settles, [e-cigarettes] will be as bad as cigarettes. The risk profile may be different, but the overall result will be negative." What's next: Watch for local and state governments to take direct action, both Glantz and Drope say. Just last month, San Francisco banned flavored tobacco products, including candy-flavored vaping liquids, despite R.J. Reynolds Tobacco Company's $12 million campaign. The FDA has taken a strong stance against the unlawful use of e-cigarettes by youngsters, particularly in their use of the vaping product Juul, which looks like a cool USB flashdrive, offers multiple flavors and is popular enough to have become a verb: "juuling." The agency is also examining lowering the amount of addictive nicotine. But, Drope warns that limiting the nicotine quantity may "defeat the purpose" of helping people quit smoking. What needs to be done, he says, is to increase state excise taxes on tobacco products. The FDA is also considering limiting the flavors available for e-cigarettes. Meanwhile, lawsuits against Juul and against the FDA have been filed in recent months. The FDA does not comment on pending legal actions, but Juul told Axios' Marisa Fernandez earlier this week that the company "does not believe the cases have merit and will be defending them vigorously." Go deeper: Read Eileen's full story here. A sense of optimism prevailed from the myriad presentations at the Alzheimer's Association International Conference in Chicago July 22–26, particularly concerning a successful phase 2 drug trial, Eileen reports. The big picture: Researchers are chasing an elusive goal — understanding how and why Alzheimer's develops and what can be done to slow or halt the progressively degenerative disease. Three trends came into focus at the AAIC18: research into drug therapies, a focus on women and diet, and strategies to catch Alzheimer's at an early stage. BAN2401 — The biggest buzz at the conference was generated by the announcement yesterday by Eisai and Biogen on their phase 2 study on a new medication called BAN2401 for early Alzheimer's. Researchers said patients who received their highest tested dose showed a 30% drop in cognitive decline in one of the measures (ADCOMS) compared to those getting the placebo. STAT and WSJ also look at the details. However, Bloomberg writes about some concerns. Anavex 2-73 — Results posted for the phase 2a trial of this drug generated some excitement for precision medicine. They said about 80% of participants showed improved cognition and daily living scores. The drug relies on biomarkers to help determine who would benefit most from the medication. Drug pipeline summary: AAIC's Current State of Alzheimer's Drug Development shows there are 68 drugs currently in phase II trials, and 31 in phase III. There is a need for more participants and for diversity among those taking part in Alzheimer's trials. Why it matters: There hasn't been a new Alzheimer's drug approved by the Food and Drug Administration for 15 years — despite the 5.7 million Americans living with the illness or dementia, costing the U.S. roughly $277 billion in 2018 alone. Americans have mixed views on how far to take gene editing technology, favoring it to improve the health of their offspring, but opposing it to enhance a baby's intelligence, according to a new Pew Research Center survey out today. Why it matters: As the science of gene editing inches towards the point where it's safe to use in humans, society will face a choice of how far is too far when using it. The prospect of so-called "designer babies" clearly rattles many, judging from the poll, but it's also unrealistic considering doctors' focus is to use this technology to treat illnesses. The details: The poll of 2,537 U.S. adults was conducted between April 23 and May 6 by the Pew Research Center. Americans with high levels of religious commitment are split 46% (yes) to 53% (no) over whether it is appropriate to use gene editing to cut a baby's risk of developing a disease later in life. However, 73% of those with low levels of religious commitment think this is an appropriate use of medical technology. A solid majority of 65% also said using human embryos to test gene editing would go too far. The survey indicates a possible public relations challenge for people and companies involved in gene editing, since those surveyed tended to view a future where gene editing is more widely available as one with more negative outcomes compared to benefits. Water on Mars: Scientists announced they have detected salty, liquid water about 1.5 kilometers below Mars' south pole ice sheet. The finding contains tantalizing clues about the potential for life on the Red Planet, according to Marisa Fernandez. Mars and Saturn eye candy: The Hubble Space Telescope took two extraordinarily sharp photos of Saturn and Mars around the times that those planets were at their closest points to Earth, Lauren Meier writes. "Amazing Dragon" dinosaur: The find of a new type of sauropod dinosaur in China rewrites the history of these creatures, including setting back their evolution by 15 million years, Henrietta Reily reports. Greek wildfires: While natural ignition sources or an arsonist's match may have lit the initial blazes, climate change acted as an accelerant that helped create the Greek wildfire disaster. Sea level rise: This is the story of David Tebaubau, a seaweed farmer in the disappearing Solomon Islands. The island Tebaubau lives on is tiny, measuring "24 steps across at its widest point, and 58 steps long," writes Damien Cave for the New York Times. Climate change and suicide: A new study shows super hot days can affect mental health and human physiology and projects an increase in such deaths in coming decades, writes Rob Meyer for The Atlantic. A resurgent AIDS epidemic? Laurie Garrett writes in Foreign Policy a disturbing but engaging new piece about how AIDS could re-emerge as a public health crisis due to three major trends: population growth in Africa, flawed public health strategy, and depleted resources to fight the illness. Anole lizard holds on to a purch with its toe pads against high winds in an experimental testing. Credit: Colin Donihue/Nature Video. Small-bodied anole lizards (Anolis scriptus) do not run and hide from oncoming hurricanes like one might think. Instead they cling to tree branches for survival, their bodies transforming into sails, anchored in place thanks to toe pads. Why this matters: A new study published in the scientific journal Nature this week found that hurricanes can accelerate natural selection, favoring anole lizards that have larger toeholds and shorter rear legs. It also may help solve an enduring mystery about these commonly found lizards. The possible selection of traits that allow these lizards to survive hurricanes was discovered serendipitously, when a team of researchers happened to be studying the species at the same time that Hurricanes Irma and Maria struck their habitat in the Turks and Caicos islands in 2017. Colin Donihue, a postdoctoral researcher at Harvard University, and his colleagues had just finished a survey of anole lizards before the storms struck. They then returned to the islands 6 weeks after Hurricane Irma hit, and 3 weeks after Maria, to look at the differences between storm survivors and those that did not make it. “We really didn’t know what to expect as we headed back to the Turks and Caicos." The research team found that the surviving population had larger toe pads, longer forelimbs, and shorter hind limbs on average than the lizards surveyed before the storms. "The fact that we saw the same pattern on both Pine Cay and Water Cay is one of the big reasons we think this pattern wasn’t a fluke," said Donihue, referring to two islands in the Turks and Caicos. "The repeatability of the patterns was one of the linchpins of our argument for natural selection." Go deeper: Read the rest of this story in the Axios stream.